Perfect for networking and ensuring your contact information is never lost. Digital business cards can be used as employee access cards, making it easy to communicate across departments or divisions. Make it easier for individuals to keep track of contacts. Simplify the distribution and sharing methods. Adopting this cutting-edge technology within your company will improve the way you interact with employees and business partners. 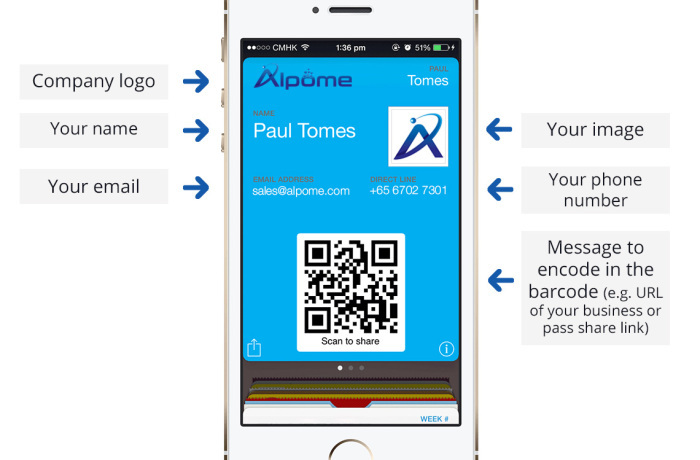 Distribute your digital business card via SMS, email, or social media. No need to hand out cards face to face. Manage data by changing and updating your business contact information and including additional information on the back of your digital business card. Make it easy for people to keep track of your business card and include unlimited amount of content on the back of your digital business card. Click on 'Add' to add the digital business card to your mobile wallet. Share the business card with friends and colleagues by scanning the barcode or sharing the pass URL.